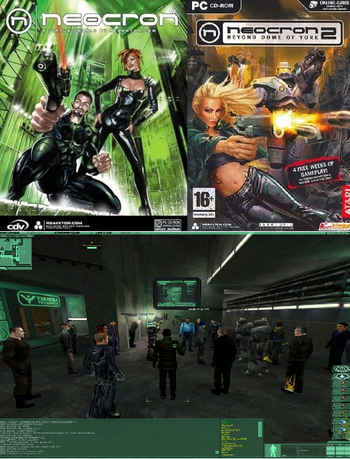 Neocron and its later expansion-turned-sequel, Neocron 2: Beyond Dome of York is, as considered by many, the very first (and perhaps only) cyberpunk MMORPG, fusing together elements of both traditional MMOs and the relatively faster-paced combat style seen in first-person shooters; in a time long before "action combat" (such as in Guild Wars 2) was a marketing buzzword in the MMO scene. The original game was developed by Reakktor Media and published in 2002 by CDV Software, while its 2004 sequel had 10Tacle Studios take up publishing duty. The game received middling, mixed reviews and netted a Metacritic score of 66, as its FPS-style interface and combat systems proving rather divisive. Despite its presence on this site's Defunct Online Video Games list, the game - despite now being sixteen years old (two more than the now seemingly immortal World of Warcraft) and its original developers having experienced financial troubles twice - is still in an active if played-by-few state, the reins of the game having been given to a team of skilled fans. Absurdly High Level Cap: While it doesn't possess the traditional level system of other more established games, the main five skills in which a player can gain experience - Intelligence, Constitution, Strength, Dexterity and Psychic Power - have caps which, regardless of the archetype chosen, add up to 300. Beyond the cap, for a character's main stat, is the Wisdom of Ceres system. Though, given the sheer amount of XP required to hit the regular cap, very few players ever got to shoot for a WoC level and the rewards doing so conferred. Crapsack World: World War 3 happened in the 22nd century. Lasting just six hours, the nuclear armageddon which ensued sent the earth itself into chaotic flux for centuries; with earthquakes and violent storms reshaping the continents to an unknown extent. Humanity only claws itself back up to a tribal state after three hundred years. It isn't until the mid-28th century that, through the discovery of a knowledge project started six hundred years earlier, humanity's able to start rebuilding. And then the biggest city in the known world has its population reduced to the better part of a million people through a combination of coups and interstellar colonisation and has a former co-leader of the biggest terrorist faction in existence as its sole, all-powerful leader. Determinator: A meta-example in that the game itself is one. Over the course of sixteen years, it's had two different publishers, Reakktor went through financial issues twice before eventually throwing in the towel, handing the game over to a team of fans in the process and, somehow, the servers are still running. Domed Hometown: While the dome itself is a Star Trek-esque energy barrier rather than a solid construct, Neocron is one of these, the barrier serving to protect the town's million inhabitants from the Wasteland's radiation. Flawed Prototype: While World of Warcraft popularised and polished the technology by applying it to just about all of its PvE content, Neocron actually possessed instanced player housing, with passwords entered into the elevator keypads determining whose apartment you visitednote Every character, for example, started off with a small basic apartment whose password was simply the character's name. Larger apartments came with keys, with which the owner could change the password to whatever they wished.. Like numerous things in Neocron however, it wasn't a stranger to bugs. Fantastic Drug: While not an illegal narcotic, ProtoPharm's Vitae vaccine qualifies as one of these; essentially signalling the end of debilitating disease. However, almost a century later, their efforts to recreate Vitae - which was stolen by the Brotherhood of Crahn - resulted in Spirula; a drug which caused irreversible genetic mutations in anyone who took it. pro-City: City Administration, NEXT, Tangent Technologies, Bio Tech, ProtoPharm, Diamond Real Estate and City Mercsnote The City Mercs officially declare themselves as a neutral party due to the nature of their business as a PMC, but they aren't viewed as enemies of the state for precisely that same reason. anti-City: Fallen Angels, the Brotherhood of Crahn, Twilight Guardian, the Black Dragon and the Tsunami Syndicate. Mega-Corp: The twelve factions a player can choose from are these. Most of them literally, while others are simply the biggest and most noteworthy examples of their kind. Powered Armor: Although the PSI Monks' version is little more than a hooded cloak that obscures their face, the best armour in the game for the four classes is referred to as "Power Armour". The Triads and the Tongs: The Black Dragon crime syndicate is a fusion of both the Triads and The Mafia, due to the allegiances of the original founders, Nico Manecci and Wan Tokai. Private Military Contractors: The City Mercs faction is the closest thing to one of these that remains in the post-apocalypse.